Globally March 2018 was the sixth warmest March since reliable measurements began in 1880, 0.89°C warmer than the 1951-1980 mean. March temperature was +1.16°C relative to the 1880-1920 base period that provides our best estimate of pre-industrial global temperature. March temperatures relative to 1951-1980 mean, in order from the warmest, were +1.30°C (2016), +1.12°C (2017), +0.92°C (2010), +0.91°C (2002) and +0.90°C (2015). The figure above compares monthly temperatures in the years 2015-2018. Note that temperature began rising in the latter part of 2015 as an El Nino was developing. That late 2015 warming led to record 2016 global heat. Some ocean models predict that an El Nino may develop later this year, in which case 2019 could be a very hot year. Historical precedence does not favor the occurrence of two strong El Ninos separated by only 3 years. On the other hand, the human hand may be altering history. 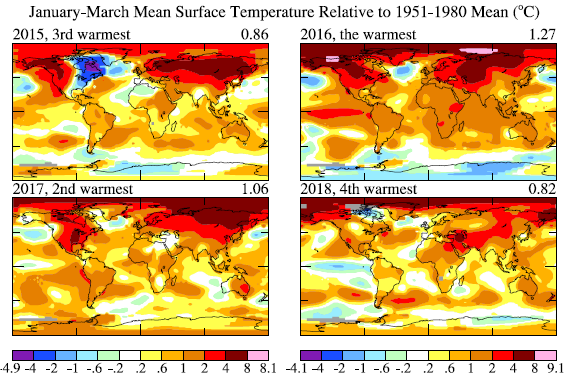 January-March this year was the 4th warmest on record, but the maps below for the geographical distribution of the temperature anomaly confirm that Europe and the U.S. were not particularly warm. However, it was nothing like the extreme 2015 cold period in the eastern part of Canada and the U.S., which caused some of the public to doubt the reality of global warming. To sign up for our monthly update of global temperature (Maps and Graphs), click here. Additional figures are on our global temperature web page.